Since we did use frequent flyer miles, we were kind of at the mercy of what was available (thus the "flexible schedules"). We flew out on the late afternoon of July 4 and arrived in San Francisco just about midnight on July 5. There were fireworks on the way, "down below" and a very nice view of Niagara Falls courtesy of the pilot and Air Traffic Control at the start of the trip. 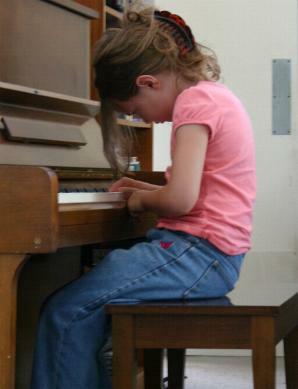 OK, now for what we do have pictures of, for example, Thalia Elizabeth at the piano at Grammy and Grandfather's House in San Jose. This time, it didn't take us long to get back to one of our favorite places on earth... Santa Cruz. Monday and Tuesday were "1907 Nights" where all rides are just one ticket-- that's 75 cents!-- and there are discounts on some other attractions and selected food items as well. 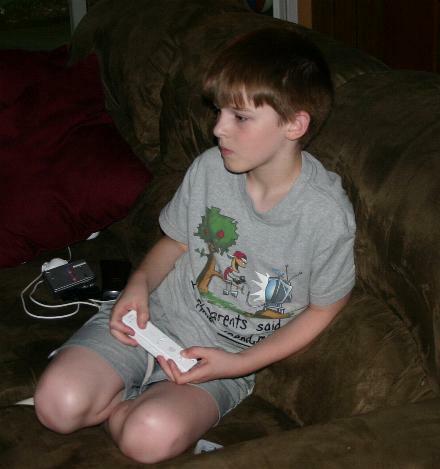 This particular 1907 Night was actually July 7, 2008. 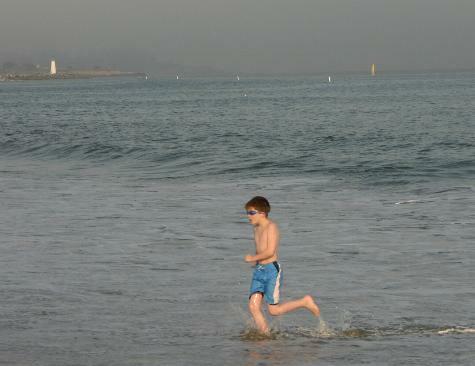 Kieran enjoys a splash in the Pacific Ocean (OK, technically Monterey Bay). 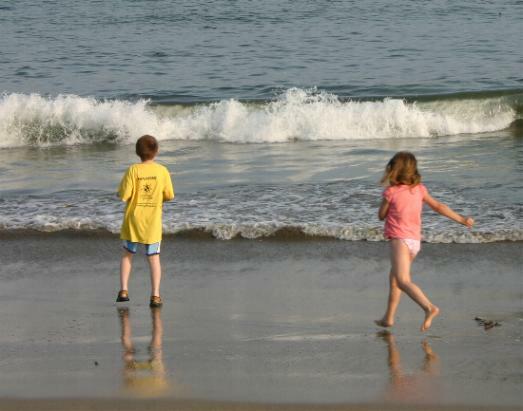 The water wasn't as cold as the Atlantic was in New Hampshire in May... or so the kids tell me. There are low clouds rolling in, and a kind of softness to the evening light... which makes for some nice images. Don't look down if you're nervous, Daddy! 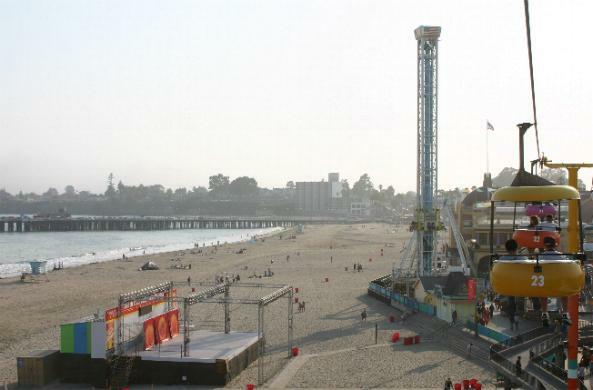 Given all the times to the Santa Cruz Beach Boardwalk, you'd think I would have made it onto the Sky Glider before. This is a view from that ride that Thalia and I braved... well, maybe Thalia enjoyed and I braved. How high up are we again? Anyway, way down there is the stage used for free concerts on Friday nights during the summer. 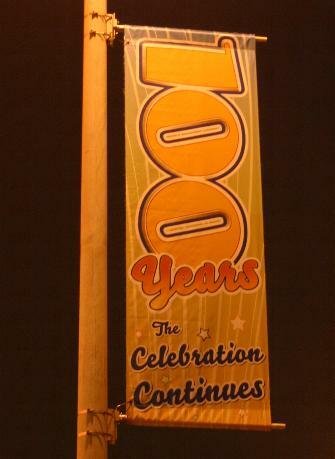 Check the Santa Cruz Beach Boardwalk site for the complete lineup. The kids are now old enough to look after themselves on rides, which gives me a chance to just take pictures. 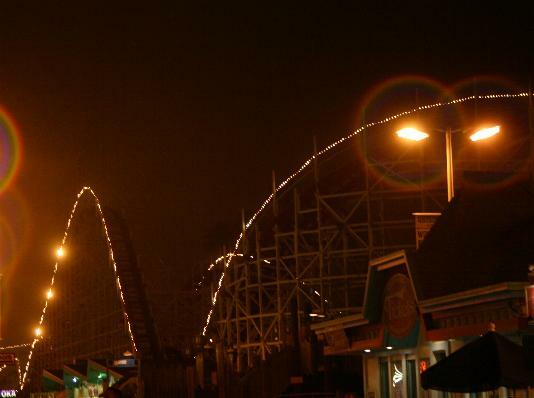 As night falls, the Beach Boardwalk lights it up, including the world famous Giant Dipper wooden roller coaster, in the background behind the kid's coaster. 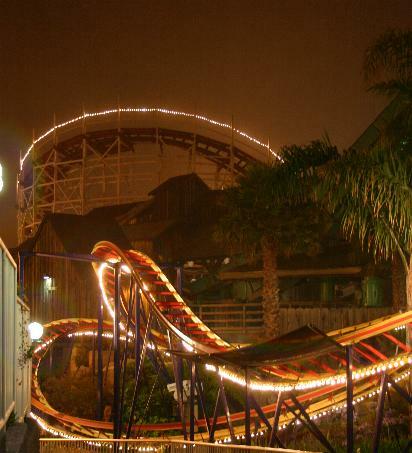 Another look at the Giant Dipper. Oh, no, it's the Attack of the Bunny Suit!!! Well, no, actually it's the kids hamming it up at the Intel Museum in Santa Clara. This is a highly recommended and manageable sized stop for anyone with even a passing interest in computing technology. And better yet, it's free. Er, is that you in there, Thalia Elizabeth? The Tech Museum in Downtown San Jose is another favorite family stop. It has reciprocal membership privileges with many science museums around the country, something worth checking out if you belong to one. 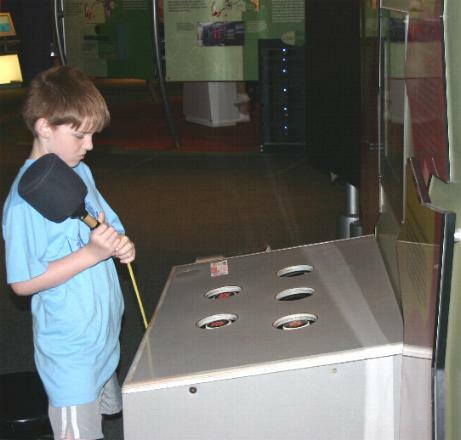 At the "Whack A Spam" display, Kieran looks almost as annoyed as we do when the "real" SPAM shows up in our in-boxes. 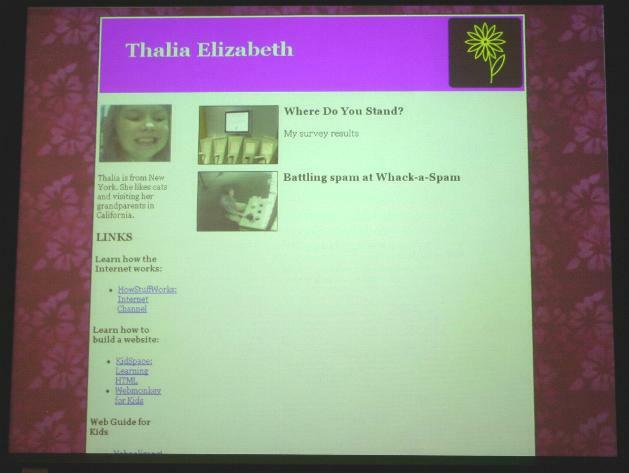 And we close Part One with Thalia Elizabeth seeing her name in lights... well, at least on a projection screen! This is a "make your own web page" interactive exhibit at the Tech Museum. Don't go away! 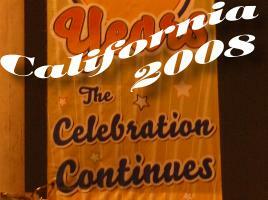 Stay with us for Part Two of California '08... right here!